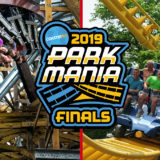 What are the best roller coasters at Six Flags Great America? 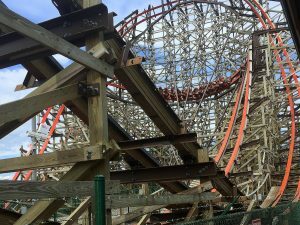 The Chicago amusement park has 14 coasters to choose from, with one more opening in a few months. 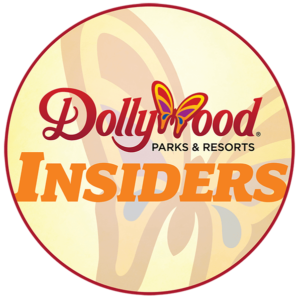 The park features an array of “mild to wild” coasters with smaller offerings suited for beginners all the way to record-breakers built for the most seasoned thrill seeker. 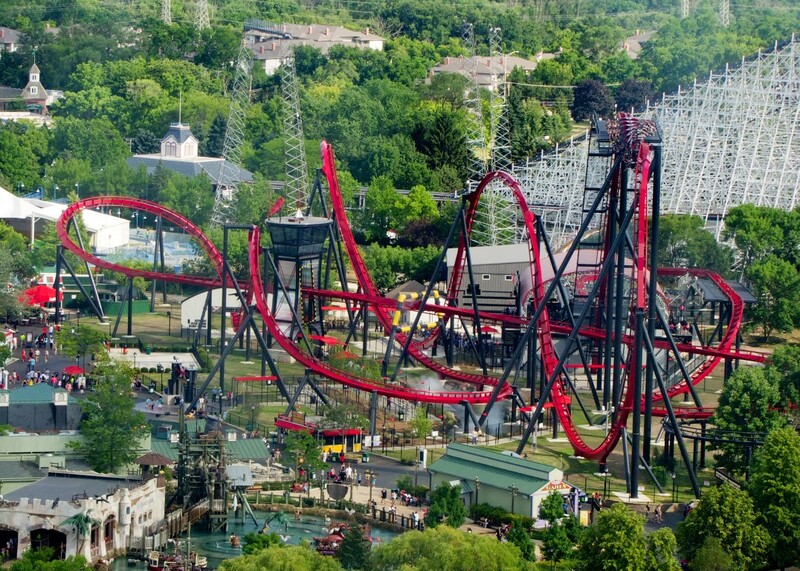 Below, I’ve ranked what I believe are the 5 best roller coasters at Six Flags Great America. But I want to know what you think. Share your own ranking in the comment section at the bottom of the page. Whizzer is one of the two original roller coasters still in operation at Six Flags Great America, opening with the park in 1976 alongside the Arrow corkscrew coaster, Demon. 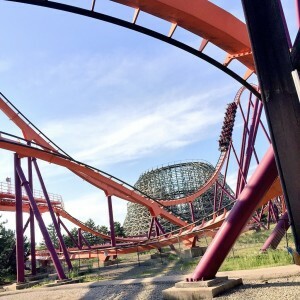 But in the nearly 43 years since, Whizzer has remained virtually the same aside from safety and maintenance-related improvements (Demon, originally known as Turn of the Century, was reconfigured in 1980 with the addition of two vertical loops). An identical coaster opened at the Great America park in Santa Clara, California – now part of the Cedar Fair chain of parks. The “Speedracer” coaster, manufactured by the legendary Anton Schwarzkopf, features three trains, each with four cars seating six riders inline. Its iconic spiral lift – powered by an electric “hot” rail – stands 74 feet tall. 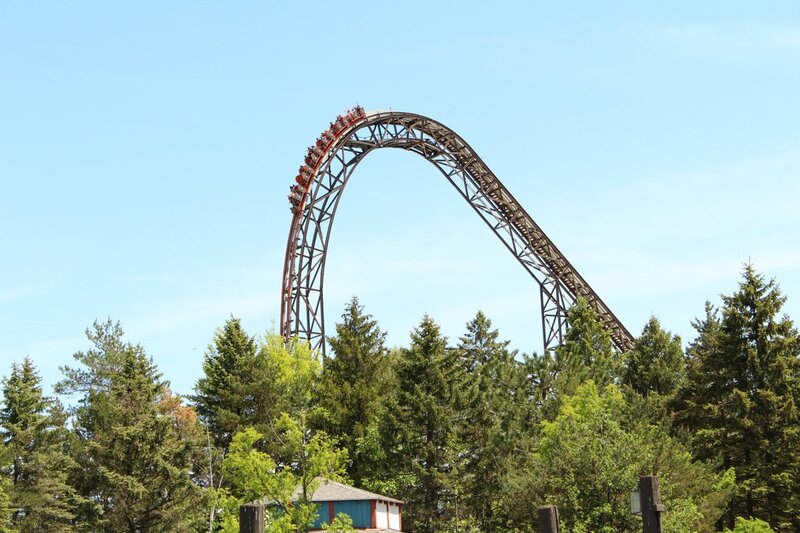 Located in the Hometown Square area, much of Whizzer’s 3,100 feet of track winds through a wooded area of the park. Trains reach a top speed of 42 mph as they zip through swooping drops and ground-hugging helices. The coaster is one of the more family-friendly coasters at Six Flags Great America. Instead of a steep plunge, the coaster’s max vertical angle is a gentler 35 degrees. The coaster is arguably the most beloved at Six Flags Great America. When the park announced that Whizzer would be removed after the 2002 season to make room for Superman: Ultimate Flight, public outcry caused the park to change course and instead shutter the large Arrow looper, Shockwave. It would have been a tragic loss. Whizzer is one of two Speedracer models still in existence. The other is at Parque Nacional Del Café in Montenegro, Colombia. Fun fact: the coaster was originally named “Willard’s Whizzer” in honor of the park’s former owner, Willard Marriott, founder of the Marriott hotel chain. Whizzer is a classic coaster that has stood the test of time. More than four decades later, it still can draw one of the longer lines in the park. Hopefully, it will be thrilling guests for many years to come. I can’t imagine the park without it. 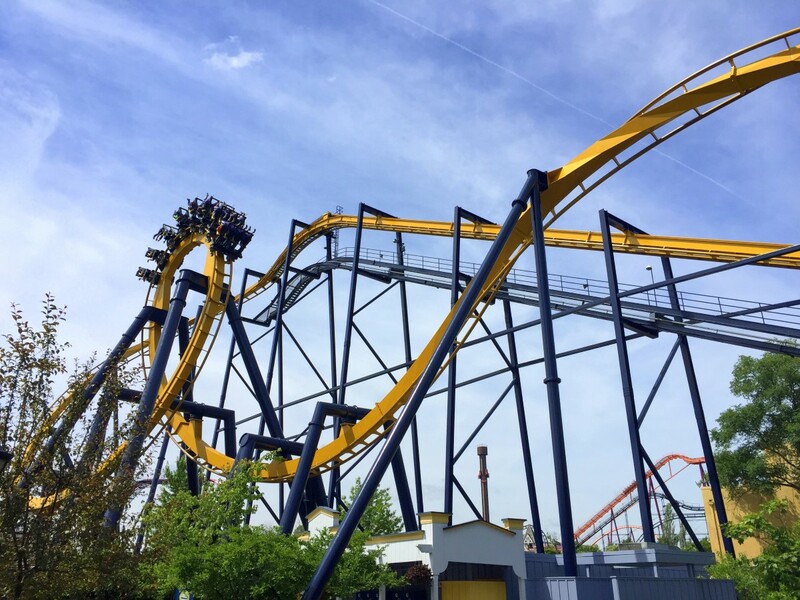 The second wing coaster to open in North America (narrowly beaten by Wild Eagle at Dollywood), the debut of X-Flight in 2012 introduced another relatively novel type of Bolliger & Mabillard (B&M) coaster to Six Flags Great America. Like many of the landlocked park’s coasters, X-Flight was shoehorned into a small pocket of land made available by the removal of a shoot-the-chutes and antique car ride. The inverting dive offered an experience unlike anything else at the park (until Joker opened in 2017). The two zero-G rolls are forceful yet smooth. The final helix often leaves me seeing stars. X-Flight takes full advantage of its compact layout with many head- and foot- “chopper” moments, including a “keyhole” element where the train flies through a small air control tower. 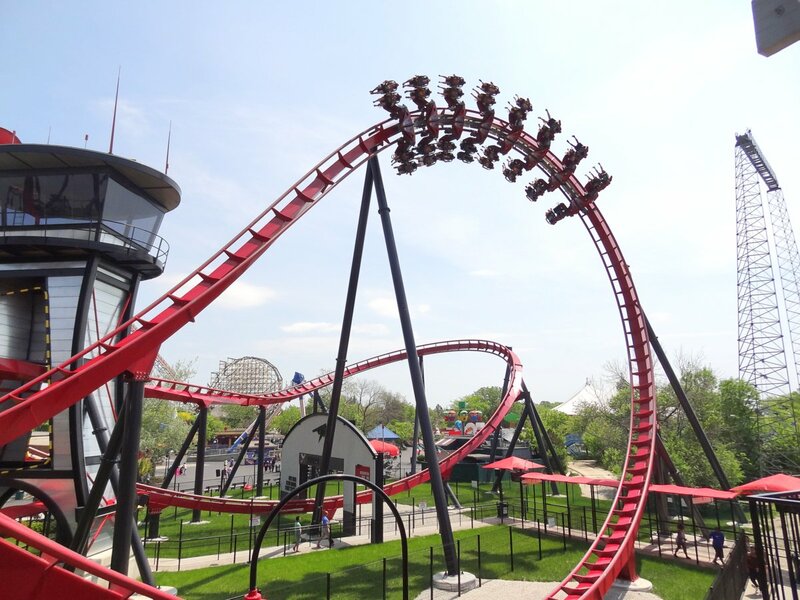 Standing 120 feet tall, X-Flight may not dominate the park’s skyline, but this wing coaster’s pacing and intensity make it a top-5 Six Flags Great America coaster in my book. 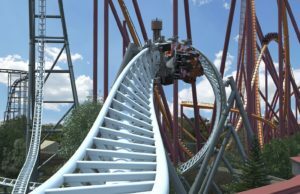 Read our review of X-Flight from its media preview event here. Even before X-Flight, Six Flags Great America has been a testing ground of sorts for Bolliger & Mabillard and other roller coaster manufacturers. The park was home to the company’s first coaster, the 1990 stand-up Iron Wolf (now at Six Flags America). And two years later, the company opened a game changer: Batman: The Ride. 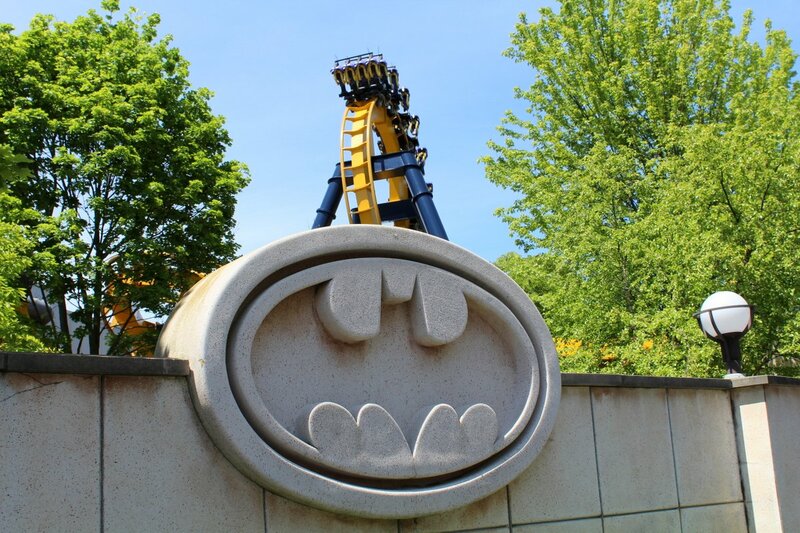 The world’s first inverted coaster, Batman: The Ride’s compact layout was designed specifically for a narrow tract of land once home to a Schwarzkopf shuttle loop coaster. 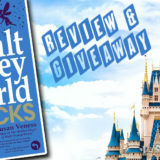 The ride’s deceiving height, unrelenting pacing and snappy inversions make for one of the more intense rides at the park. Batman: The Ride was built at a time when the Six Flags chain was owned by the Hollywood-grown Warner Bros. company, which invested heavily in new rides’ thematic aesthetics. As a result, Batman: The Ride touts a Gotham City-themed queue and station fit for the Caped Crusader himself. Batman: The Ride stands roughly 10 stories tall. Its swooping first dive leads into a vertical loop, zero-G roll and another vertical loop. 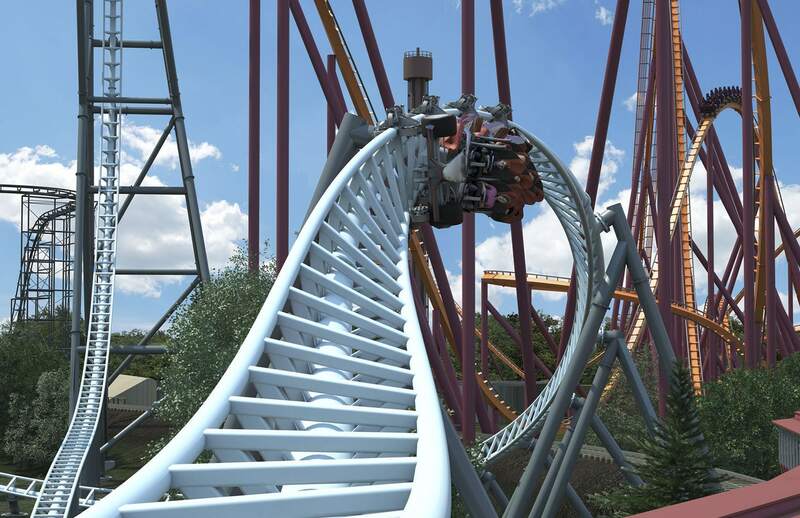 From there, the coaster’s second half resembles a bowl of spaghetti – complete with two “flat spin” corkscrews. Its popularity and footprint spawned numerous nearly identical “clones” at Six Flags and other parks in North America and Europe. Fun fact: American Coaster Enthusiasts designated Six Flags Great America’s Batman: The Ride a “Coaster Landmark” in 2005. Rightfully so, I think. 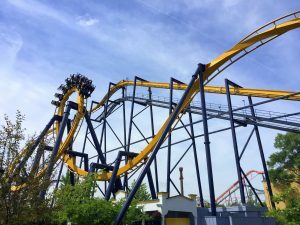 Batman: The Ride undoubtedly cemented Six Flags Great America as having one of the most elite coaster collections in the Six Flags family of parks. And it remains one of the most popular coasters at the park to this day. Celebrating its 20th birthday in 2019, Raging Bull was B&M’s second hyper coaster (a coaster standing at least 200 feet tall), opening less than two months after Apollo’s Chariot at Busch Gardens Williamsburg. 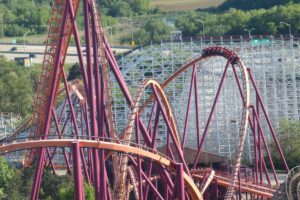 Unlike the out-and-back layout of Apollo’s Chariot, Raging Bull features a more compact, twisted layout to fit into a section of the Southwest Territory area. The train’s first 208-foot drop into a tunnel is accompanied by the iconic B&M roar, very fitting for a coaster named after a bull on the loose. Raging Bull’s open-air trains feature clamshell restraints with no belts, which offer riders an unobstructed, airtime-filled ride experience. Even after a mid-course brake run, the train maintains its energy as it navigates a figure-eight finale. Like Batman: The Ride, the Warner Bros.-era Raging Bull features a themed queue and station – this time to the old U.S. Southwest Territory. The lift hill is to this day the tallest at Six Flags Great America, providing breathtaking views of the surrounding area, upstaged only by Sky Trek Tower and Giant Drop. Despite its three-train operation – each with nine rows of four riders seated abreast – Raging Bull can still pull a long wait during peak times. Regardless of what coasters the park adds in the future, Raging Bull will likely remain one of the most popular. The record-breaking Goliath redefined the limit of what a wooden roller coaster can do. 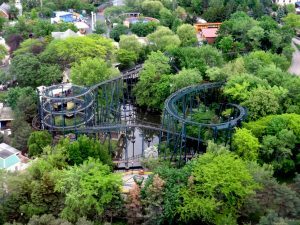 It broke three wooden coaster world records when it opened in 2014: longest drop (180 feet), steepest drop (85 degrees) and fastest at 72 mph. Like many Six Flags Great America coasters before it, Goliath’s short-but-sweet layout was squeezed into a small plot of land (made available by the removal of Iron Wolf). Very little of the coaster’s 3,100 feet of track was wasted. From the time the train leaves the peak of the lift to the time it enters the brake run, the speed, pacing and intensity is relentless. The ejector air is plentiful. Throw in two inversions — including the wacky zero-G stall — and you’ve got a world-class coaster that is a force to be reckoned with. Read our Goliath review from the media preview event here. 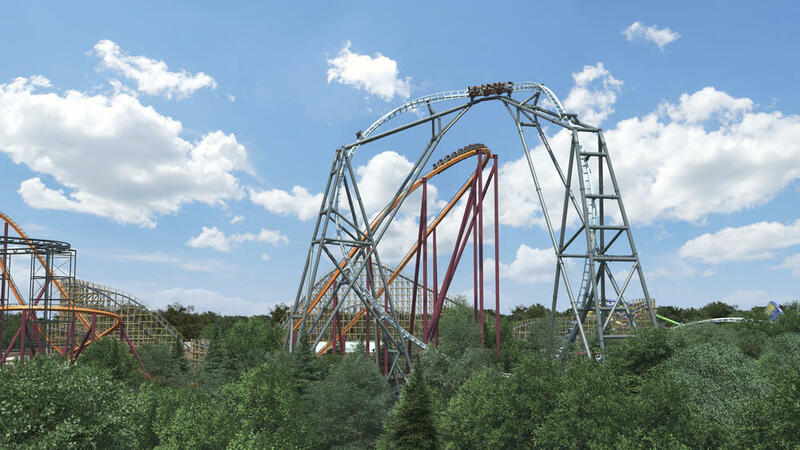 When it opens this spring, Maxx Force will undoubtedly insert itself somewhere on this list. A triple record-breaking coaster, Maxx Force will feature the fastest coaster launch in North America — from 0-78 mph in less than 2 seconds, the world’s tallest double inversion and the world’s fastest inversion. How do you rank Six Flags Great America’s coasters? Share your own ranking in the comment section below. Whizzer is a nostalgic favorite of mine.